What Your School Website Needs | Infomedia, Inc.
Give parents of potential students and current students peace of mind by making your school an organized and efficient site. Technology is a huge part of the education system, from iPads in classrooms to Skype study sessions, and that means that schools need to have websites that reflect that too. Stay up-to-date, plus keep your students and their parents in the loop, by having an easy to navigate website that highlights your school’s unique offerings. Read below to learn our design and development teams’ top five must-haves. Since curriculum is such a cornerstone to education, it’s important to highlight what your school teaches in a “Curriculum” page. This may include references to specific textbook publishers, teaching styles or methods, the school’s moral leanings and more. If the materials used for classes varies by each teacher or grade, then your school can still have a curriculum page and instead focus on a generic overview of topics instead of detailed listings. 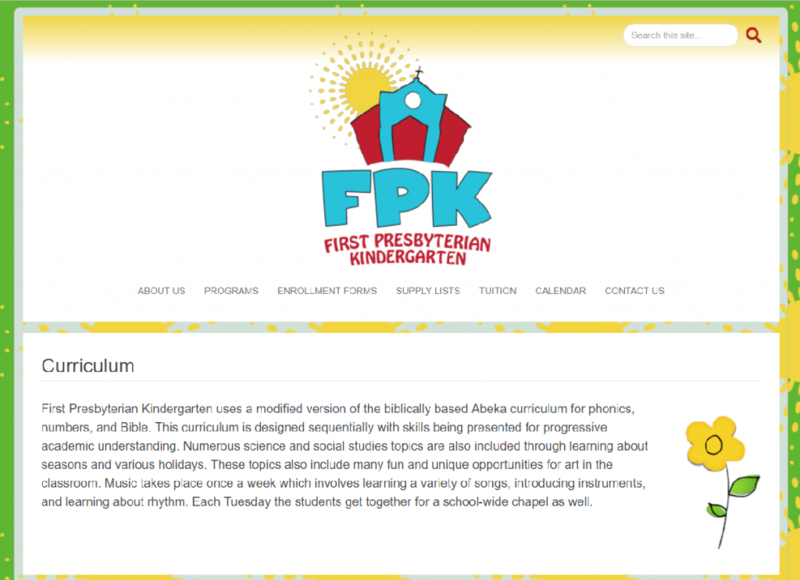 We like how Infomedia client First Presbyterian Kindergarten keeps their curriculum page short and sweet while still highlighting their textbook choices, teaching methods and a brief overview topics. If your school requires application for admissions, make a page that displays any and all requirements. This will help parents who are looking at your site find out if there’s a waiting list, what tuition rates are like, if there are any district restrictions and other important information. This can be laid out in a standard written page, or presented as a frequently asked questions format. Most schools are abuzz with activity, whether it’s a canned food drive or this month’s pep rally, and having an events section will make keeping track of everything even easier. This will help keep dates organized, allow the school to add links to volunteer sign up pages and give parents an overview of the upcoming school year. 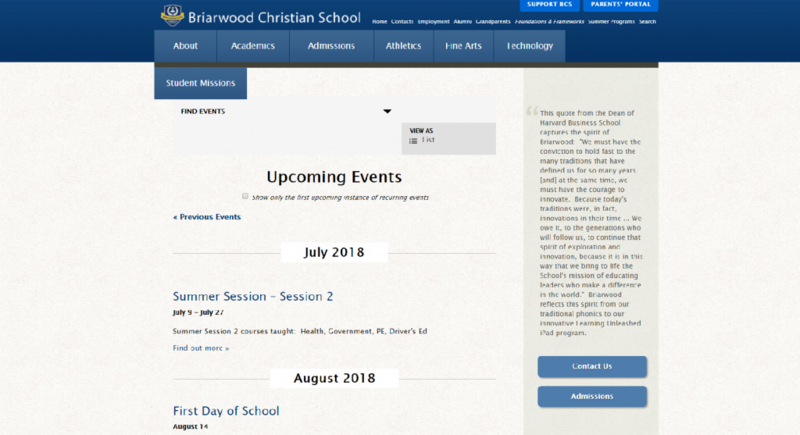 Briarwood Christian School, an Infomedia Client, keeps their happenings organized in this streamlined events page, which can be viewed in list or calendar format. Extracurricular activities are a large part of the school year, so dedicate a page to relaying what your school has to offer. This can include everything from athletics to various clubs and programs. If you a large amount of information to share about multiple activities, it may be a good idea to break them down into categories like “Athletics” and “After School Programs” and have a page for each. If you’re a school with multiple class options, show it off! These classes may be divided by age, ability or learning interests. Either way, it’s helpful for parents of potential students to see exactly what each class includes and for whom the curriculum is intended. This can be achieved by creating page on your site for class descriptions. We think that Covenant Classical Schools, an Infomedia client, has a well-organized classes page with detailed descriptions of each offering. If you’re a school administrator and are considering a new website, Infomedia would like to work with you. Simply contact us to start a conversation, no-commitment required, about your website needs and find out what services we can offer you.